On 24 May, the research vessel Pelagia docked at the NIOZ home base on Texel after an 8-month expedition. 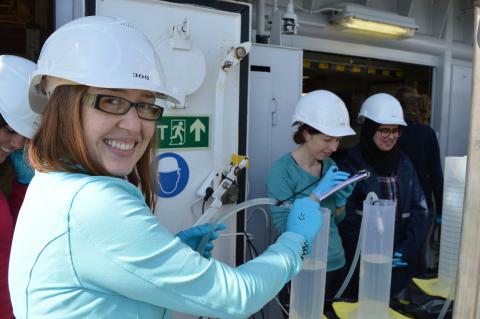 NIOZ researcher Darci Rush (organic geochemist) went on board during the seventh leg of a 12-leg voyage. Aboard the Pelagia, she studied the behaviour of microorganisms in ocean areas with low oxygen levels. Besides this initial hiccup, Rush’s research on the Pelagia subsequently took a different course than planned. Measurements revealed that the water was not sufficiently oxygen-deficient. ‘There was no time to localise the zones without oxygen', she explains. Then Rush and Van Grinsven accidentally stumbled across a brine pool of 400 km² at a depth of 2 km below the sea surface. These brine pools occur elsewhere as well, but the conditions in these are rare: the extremely salty water has stood still for thousands of years, and consequently, there is a virgin closed system with its own biodiversity. In the samples from the brine pool, Rush hopes to find remnants of microorganisms that live on methane. Recalling her expedition on the Pelagia, Rush simply states: ‘The best cruise ever. As we were delayed, we wanted to do research 24/7. This also meant that the support crew had to work much longer hours. Partly due to their efforts, the atmosphere on board was incredibly pleasant.’ Rush will hire a PhD student to work on the samples she took during the expedition and hopes to publish interesting research results soon. Furthermore she wants to take part in another expedition in February 2019: hopefully, the Pelagia will then cruise along the coast of Namibia where low-oxygen zones are also found.